Walking the spiritual path can seem very lonely at times, but whether or not we are physically alone, we can count on having one constant companion: resistance. Put simply, whatever we try to do there will be an ever-present force working against us. In the physical world, for example in electrical circuits, resistance is required to prevent overloading. In our daily lives, resistance in the form of friction makes many activities possible – without friction many activities we take for granted such as walking and driving would be impossible. In our spiritual life resistance is necessary for growth. If there is too little resistance then challenges become too easy to overcome and consequently there is little development. Too much resistance can make challenges too hard to overcome which also results in little development. Whether or not there is too little, too much or just the right amount of resistance for optimum growth means little if we feel that there is too much. For some reason, in spite of the fact that the existence of resistance is probably the most reliable fact in the known universe, we seem to expect life to be easy. When it turns out to be a challenge we constantly seem surprised, irritated and indignant about it. How can we develop a healthy approach towards resistance? Firstly we must accept that resistance is a necessary part of life. Not only is it necessary and therefore something we must accept, it also serves our development (even if it doesn’t seem that way most of the time). Resistance is a bit like having rules in society. Although it can be irritating that we are not allowed to do certain things like park our car wherever we want to, we understand that these rules make society function more smoothly for everyone. Without them life would be unworkable. So too it is with resistance. In physical worlds resistance is a fact. So the first step is to accept it and learn to recognise that it actually helps us to grow. Once we have accepted resistance we need to develop a healthy attitude towards it so we can work with it rather than against it. At times we will need to see resistance as a force to be overcome whereas at other times it will serve us better to see resistance as a necessary component of life and to yield to it. Developing a healthy approach towards resistance is aided by practising the cultivation of positive qualities and the rooting out of negative tendencies. This will help us greatly with our mental attitude towards resistance and also help us to deal with our emotional reactions towards it. On the physical level we also need to learn practices to raise our consciousness and our vibration. On this level we can see resistance as darkness and any practice for overcoming physical resistance as bringing in more light. Resistance often manifests in the physical body as a lack of energy, lethargy or tiredness. It can also manifest as aches and pains. Some people like to busy themselves with deciding whether or not the resistance they are faced with is their resistance or somebody else’s. But the fact is that it really makes very little difference. If you are faced with resistance then it is your challenge to overcome it, regardless of why or how it came to be in the first place. In many respects we can see the challenge of overcoming resistance as a game. We are attempting to get somewhere, something pushes against us, and we need to develop a strategy and use the tools available to outsmart our opponent. Our tools are the qualities which we learned in the cultivation and weeding sections. There are many more words we could have used to describe the various qualities to be cultivated and the multitude of vices to be weeded out, but the intention of this book is not to provide an exhaustive list of labels but rather to encourage you to read between the lines and absorb the essence of what is being said. In practice there is often no dividing line between acceptance and surrender or between perseverance and determination. These definitions belong only to the mind. They have some sense of reality within the mind but not so much beyond it. It is similar to the way that we divide the calendar year into twelve months or a circle into 360 degrees. These divisions and definitions work very well for improving efficiency in the outer world but it is worth reminding ourselves that months and degrees are essentially labels and nothing more. The essence of a year or a circle is not the dividing lines of months or degrees but rotation – not the word “rotation” but rotation itself. So when it comes to our spiritual development we need to look past the labels of non-judgement and strength and develop the ability to discern when to yield (yin) and when to stand firm (yang). If we think too much about whether we need to surrender, practise non-judgement or be more determined, we run the risk of falling into a trap of intellectual debate. It is ultimately not the defining of resistance that will enable us to overcome it but the application of the quality which is being defined. 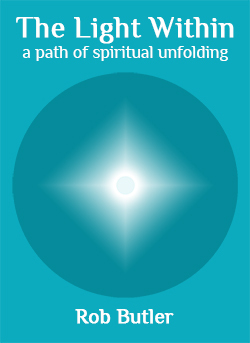 We could have talked about fear, confusion, doubt, tolerance and many more labels – some of which may be seen by some to be fundamental in any approach to spiritual development – but instead of being a dictionary of terms, this book is intended to encourage you to look beyond the terminology and feel your way through the reality of what is being defined. When a situation becomes especially difficult we need to be able to discern whether we are on the right track and need to persevere or whether the difficulties are signs that we are on the wrong path altogether. When we try to do something and it doesn’t seem to work out it can be tempting to conclude that we are “not meant” to be doing it or that it is not our path, but sometimes we are tested and such challenges are presented to us as difficulties to be overcome. How we know whether to push on or turn back is down to discernment. As we progress along the path of our development we find that discernment becomes increasingly important – so important in fact that we might wonder why writers don’t say more about it. The truth is that there is not much that can be said about discernment and it is not something that is easily taught. It is one of those qualities which need to grow from within – no amount of outer instruction will help us in this respect. On a practical level, overcoming resistance can often start first thing in the morning. We wake up, we know we have to get up, but would rather not. Perhaps we have to go to work, take the children to school or look after a relative. The first step is to accept the situation “that is”. If we need to go to work we need to accept that. But then we need to apply some self-discipline or determination to make sure we actually get out of bed and leave the house on time. Thinking about it won’t do much good. Ultimately we just have to do it. When we are trying to get somewhere or achieve something and obstacles appear in the way, the tendency can arise to greet these obstacles with irritation. We might label them as bad or unnecessary. We may even turn our dislike inwardly and conclude that obstacles are a sign that we are not doing well enough and perhaps did not “think things through properly”. But in these situations we would do well to pause and reflect long enough to ask ourselves the question of whether we have formed an attachment to the outcome we are hoping to see and whether we are practising acceptance of “what is”. If we look at the way the tide comes in we can see that the waves come in and then go out repeatedly. Each time they come in they come in a little bit further. They come in and go out, come in and go out. The tide does not come in all at once and if it did our lives would be much more perilous. It often seems as though our lives follow a similar pattern: we move forwards, then have to take a few steps back, then we move forwards again, step back, move forwards and so on. The more we go into judgement and non-acceptance of resistance the worse it seems to be – with this approach it will seem as though we are making no progress at all. But if we accept resistance and stop fighting it we can learn to see it as an opportunity for pause, rest or reflection. If we are trying to achieve something and obstacles stop us in our tracks, we are given an opportunity to reflect, consider what we are attempting to do, and make doubly sure that we are going about it the right way and have not overlooked anything.